I hate it when bots or social media algorithms recommend me books. But I love it when a human does, especially a writer, and especially a writer who works at Lighthouse. If that writer happens to be Ben Whitmer, all the better. A few months back, Ben recommended to me Get Carter by Ted Lewis. This recommendation was good timing—me having been on a noir reading kick for a while. 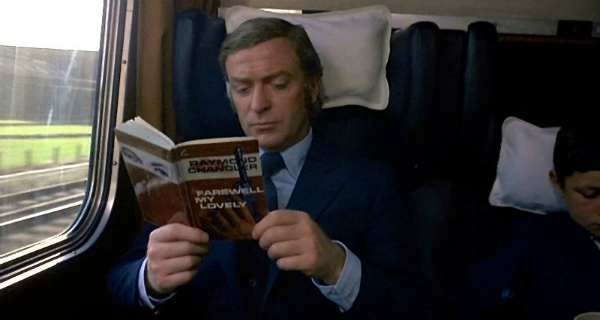 I read Get Carter in a couple of binge sessions, and chased it with the 1971 film adaptation starring Michael Caine (pictured above). It was a good weekend. But the experience of the recommendation kept going. I was slated to teach a Friday 500 on backstory and was having trouble deciding on a text to use. My troubles ended when I realized Lewis's novel was the perfect example of how to write backstory. For example, on page 12, Carter has a flashback. In it, he remembers being a teenager and watching his brother get the snot beat out of him by a mobster. This event forms the belief that his family is weak, and in order to have a strong family, Carter must join the mob. One-hundred pages later, Carter has flashback number two. He remembers fighting his dad, and his dad kicking him out, reinforcing his worldview that the only family he needs is the mob. That's it. Both flashbacks come out to less than a page. However, because they're placed in the perfect position for this book, the backstory gives the reader plausibility that Carter is a human being with a past which is being properly tested by his plot goal: find out who killed his brother and why. Carter's revelation at the end of the book is (spoiler alert!) that he's willing to die for his family (his biological family). The perfect book recommendation matched with the perfect timing of reading a book is a rare thing. But when it happens, it's the best. Dan Manzanares is the community programs coordinator at Lighthouse.